Cheese and wine is a delectable combination. Certain types of cheese go better with certain types of wine. You might be looking to serve cheese and wine for dinner guests, or maybe you just love eating this treat with friends, family, or a significant other. Either way, you choose to enjoy this combination - you will find these tips helpful for pairing the right cheese with the right wine. Leaning how to pair cheese and wine is an art. There are many blogs, books, and wine tasting training sessions you can learn from. However, today, we are going to cover the top 10 tips to start you off on the right path. This tip is crucial for getting the best combination. If the cheese you’re eating has an intense flavor, then drink a wine that is equally as intense. When you have more alcohol content in your wine, and when it’s more bitter to the taste, should be put with a cheese that is intense. Some of the more intense cheese tastes tend to be, Cheddar cheese, Blue cheese, Aged Gouda, Sharp Provolone Cheese, Grana Padano, as well as strong Parmesans. Red wine tends to taste better with older, aged cheeses. Aged cheeses are stored in a cellar for at least 6 months before being packaged and bought. The longer a cheese sits to age - the more water it loses. This creates a strong and delicious flavor. Put your bold red wine with Gouda, Parmesan variants, Cheddar, and Parmigiano-Reggiano. Another way to know which cheese should go with which wine is to pair them together by country. If you have an Italian Cheese, combine it with an Italian Wine. French wine goes with French cheese and so one. Certain countries are known for having certain flavors and spices associated with the country. So by pairing the wine and cheese from a similar region, you’ll be highlighting what that area is known for. As you may know, some cheeses have a sort of funk to them. The best way to downplay this is to combine it with a sweet wine such as Moscato. 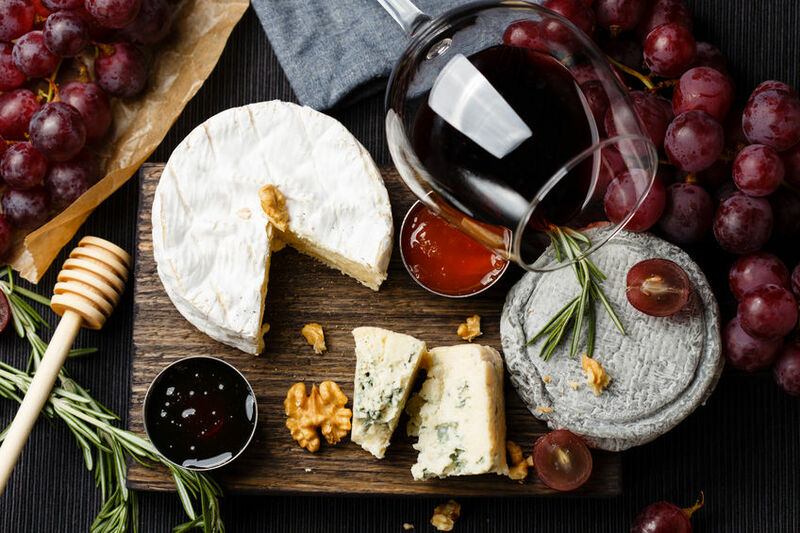 These types of wine and cheese are on opposite sides of the taste spectrum. The opposing tastes balance each other out for a nice snack. Sparkling wines include; Champagne, Cava, Prosecco, Espumoso, and Sekt. When you think of creamy and soft cheese the following may come to mind; Brie, Mascarpone, Camembert, and Feta. These creamy cheeses are perfectly offset with the sizzling and bubbling effects of sparkling wines. The saltiness and bitterness of Goat cheese balance out when drinking dry wines. Dry wines don’t have much sugar added to them, in fact many have none. This is why they’re called “dry.” They do not have the sweetness that some of your favorites have. You could be hosting a dinner party and have numerous bottles of wine - but aren’t quite sure what to choose. Pick a nutty cheese. Nutty cheeses have a hard consistency and are aged for much longer than other types of cheese. Special occasions probably come to mind quickly. Hosting a dinner party for your co-workers or trying to impress new friends could call for a lush wine and a cheese tray. Some people are served wine and cheese at the business meeting related to work or school. Keep in mind that wine and cheese is a sophisticated snack, so make sure you are around the appropriate audience. Invite your friends over and ask everyone to bring their favorite wine. 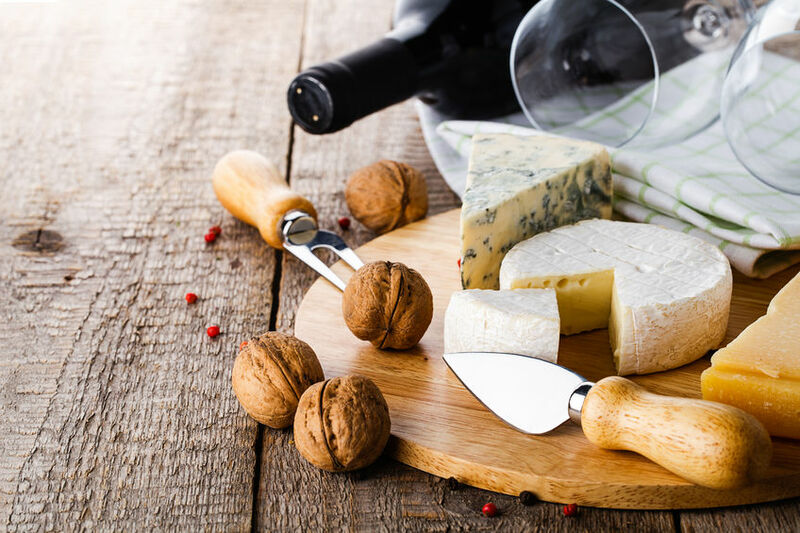 You may want to ask them before the party which wine they’re bringing so that you can plan to combine the perfect cheese for a memorable night with friends. Your wine and cheese pairings are not complete without some delicious fruits. Add grapes, strawberries, blueberries, or any other of your favorites. Remember to put similar flavors together, sweet fruits with sweet wines. You could also try opposite flavors to even out the taste if the cheese is too strong. If you really want to wow your guests, then have some activities ready for the occasion such as playing cards or board games. Make sure to have pitchers of ice water out just in case anyone needs to wash down the assorted flavors or in case there are teetotalers in the group.